The other day my kid and I were flying on our own for dinner and suddenly it was a moment where parenting is just hard. My husband had just been to Costco with her and she had decided that she now likes pot stickers. You know the Costco sample loop right, sometimes grocery store samples can work in your favor for trying to get your kid to try a new food. Anyways, now she had decided she loved potstickers so they came home with a giant bag as happens at Costco. I was prepping a salad too with it, but the bag of potstickers was in the freezer down in our basement. I told her she needed to grab the bag from the freezer and that’s when the trouble started. 14 Ways You Can Help Your Child Be Independent. Back to the pot stickers, apparently they were on the top shelf high up in the freezer. I managed to twist my ankle a few days before. There is no way I’m heading down into that basement even though I know those potstickers are what she wanted for dinner. I felt like a LAZY Mom, parenting is hard you guys. Two minutes later I felt even worse when she had been moving so fast, she had slid down the basement stairs on accident, missing the last two steps. She cried and I hugged her after her fall. I really felt awful and suggested I’d make something else for dinner along with the salad that I was busily chopping. But I didn’t agree to hobble down the stairs on my bummed foot and get the pot stickers. But then you know what happened? She went back to the basement. She found a chair, slid it over, and got those darned pot stickers. We served them up with salad and they were delicious. Sometimes in those moments when we feel like a lazy parent, we are actually giving our child a chance to learn and grow. She learned to be more careful on the stairs, and that she could solve the problem of the pot stickers being too high. The problem wasn’t “too hard” for her age. 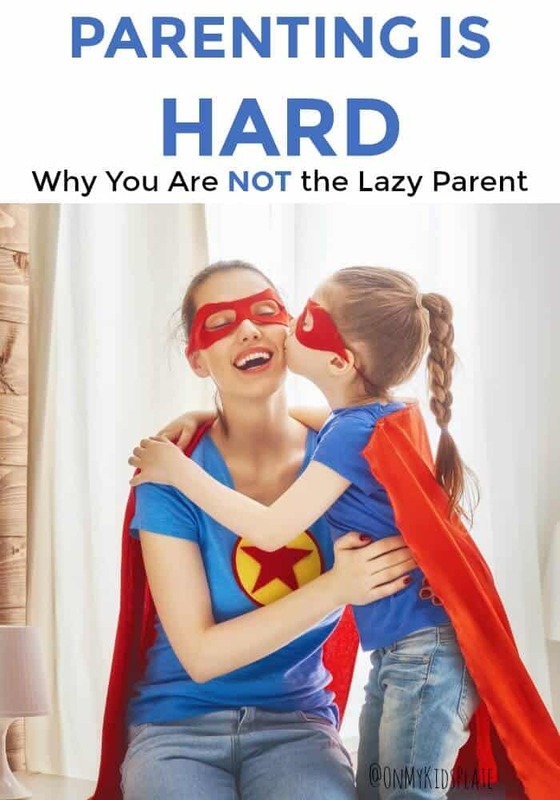 I read this article from Motherly about Why Lazy Parenting Is Really A Recipe For Happy Families, and as I had just experienced this phenomenon I realized I wasn’t being a lazy parent. I was leaving room for my child to grow. 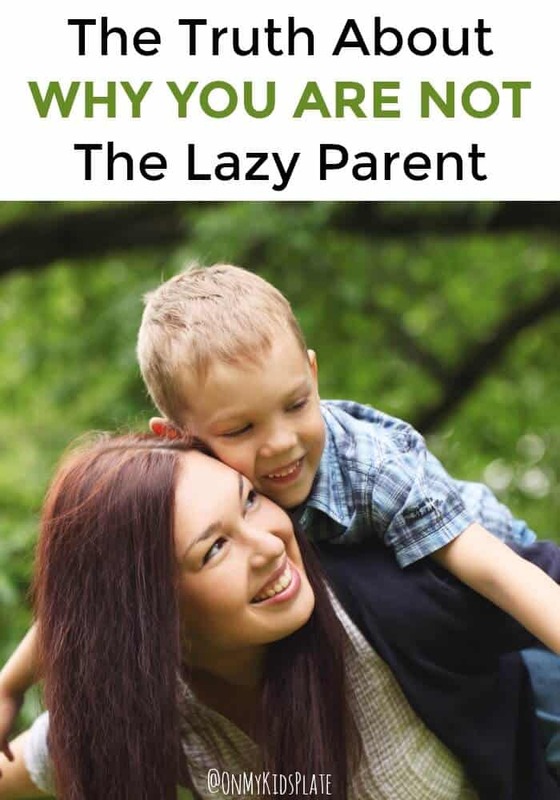 A truly lazy parent often neglects (whether intentionally or unintentionally) their child’s needs, not wants. This is not the same as allowing your children time to figure out a problem themselves or allowing them to be bored. As parents, we don’t always need to swoop in and save them. We don’t always have to ‘make things right.” Sometimes the kids can “get the pot stickers” on their own even if the problem seems “too hard.” Even if your kids end up with a bump or two along the way. You better believe the next time I send her to the basement she will know how to get something off the top shelf, and likely won’t miss the bottom step. Also if we didn’t have pot stickers, it wouldn’t have been the end of the world either. Even if she had cried, or thrown a tantrum, it likely would have fueled her more the next time to work out a solution. Or maybe not the exact next time, sometimes it takes a few tries! Breath In The Moment– Sometimes parenting can feel overwhelming when the kids are demanding. They push, they ask, and it’s just easier to do things for them because you always have. Stop, breath and count to five in your head, then answer. Even hide in the pantry for a few minutes, it is ok! Can They Do This – Ask yourself in the moment “Is this an age-appropriate task” even if they’ve never done it before. If the answer is yes, try talking them through it with encouraging words, but not intervening with help. Make Them Wait– Our world is becoming more and more instant, but that doesn’t mean that our children’s asks and wants come before what we are doing as adults every time. Acknowledge their request, but don’t always jump to fulfill it during that exact moment. I love the style (I think it is Montessori) of having a child place their hand on your arm when they have a question but you can’t answer that moment. They feel heard and know you will respond when you’ve finished your task, without having to request the same thing over and over to feel heard. Busy Yourself– It can be hard to not want to jump in and save the day. If you weren’t already running around doing a task, busy yourself with a small task while they try. Wipe the counters, organize the mail, something to keep your hands busy but not so complicated that you couldn’t stop if needed. Be Ready With A Hug- They may not accomplish the task. Sometimes children need reassurance that it is ok to try and ok that it didn’t turn out as they expected. This applies to picky eating too. As parents we provide the food, we aren’t obligated to make sure our kids eat it. We aren’t lazy parents or neglectful if we keep providing a variety of foods and our kids aren’t digging it. In the end, parenting is hard! But sometimes when we step back and breath, we aren’t being the lazy parent. We are allowing our children to learn and grow in an environment that is safe for them to make mistakes.